Kangaroos are large marsupials known as `macropods' due to their large feet. There are several species of kangaroo, the most famous being the red kangaroo common in arid regions of Australia. Forester Kangaroo, 1.15Mb QuickTime movie. Due to the more mountainous and heavily vegetated environment of Tasmania, red kangaroos are not found in the state. 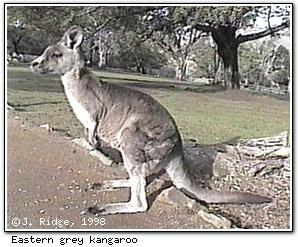 However, the grey kangaroo (also known as the Eastern grey kangaroo or Forester kangaroo) is common, and is a protected species. Forester kangaroos can reach over 2m (6'7") in height when fully upright, and can jump 8m (26') in a single bound at high speed, although this would not happen so commonly in Tasmania. This type of kangaroo are most common in Tasmania's north-east, but can also be found in central Tasmania and on the east coast.